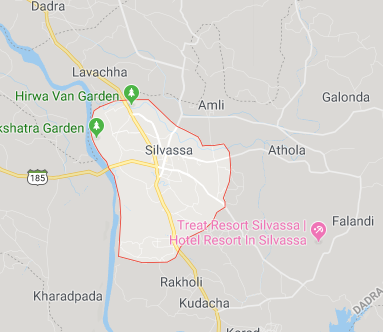 Silvassa is connected to Maharashtra and Gujarat via National Highway 848A. Silvassa has a well-maintained road network. The nearest railway stations are in Vapi 16 kilometres (9.9 mi) away and Bhilad, 14 kilometres (8.7 mi) away . Daman is 30 km away via Bhilad on National Highway number 8. Mumbai is 160 km away from Silvassa, via Bhilad, on National Highway number 8 Surat is 130 km away from Silvassa, via Bhilad, on National Highway number 8. Auto-rickshaw services ply between Vapi and Silvassa at a regular interval and easily available from Vapi (E) railway station. Gujarat Road Transport Buses ply between Silvassa & Vapi at a regular interval.